The 2012 Pig in the House Cabernet Sauvignon ($25) from NSW’s Cowra wine region has been named the 2014 NASAA Certified Organic Wine of the Year. The inaugural NASAA Certified Organic Wine of the Year Awards attracted around 100 entries from across Australia. The Awards were open to Australian wines that have organic certification from an approved body such as the NASAA. “This is the first organic wine tasting only open to wines grown and produced in Australia and certified by a Department of Agriculture Accredited Certification Body, such as NASSA Certified Organic.” explained the Awards organiser, NASAA’s Ben Copeman. The Award was overseen by some of Australia’s most respected organic winemakers; Troy Kalleske from the Barossa Valley’s Kalleske Wines, Vanessa Altman from Switch Organic Wine and Michael Paxton from Paxton Wines in McLaren Vale. The top scoring wines were then re-judged by the panel with the 2012 Pig in the House Cabernet Sauvignon awarded top honours. The Pig sat proudly on his hind trotters, glistening snout in the air as he was awarded the honour. “The wines are made at the Windowrie winery by Anthony D’Onise. Anthony has a natural respect for the organic winemaking process. This tasting exemplifies that the organic fruit coming from our vineyards and also the Cowra region as a whole is some of the highest quality in the country – that’s amazing!” said owner and viticulturalist Jason O’Dea. The Pig on the other hand has been seen rolling in mud, trotting off to market, booking international flights and eating roast beef, paired of course with Cabernet. The Pig in the House offers a full range of award winning organic wines comprising, Pig in the House Cabernet Sauvignon, Shiraz, Merlot and Chardonnay. Further information on these wines can be found at www.piginthehouse.com.au. Distribution: The Pig in the House of wines are distributed nationally and are available for purchase online through Raw Wine and Beer. For further information, images or samples please contact us on 0412 100 801. 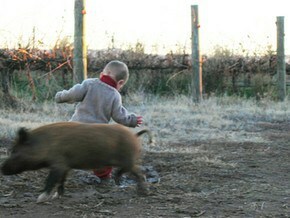 PIG IN THE HOUSE is a boutique vineyard owned by Windowrie’s Jason O’Dea and his wife Rebecca. The 20 hectare Pig in the House began conversion to organic practices in 2001 after the couple moved into an old house that sits amongst the vines and once housed a number of free range pigs. Jason has a wealth of viticultural experience, being part of the O’Dea family that owns Windowrie Estate, one of Cowra’s oldest winemaking families. The organic move by the O’Dea family was inspired by the proximity of their home to the vineyard. “With our kids running around in the vineyard, the preference for organics was a logical step. We’re farmers and love nothing more than being out on the property with the family. It was a lifestyle choice firstly, and having seen the health of the soil and vines, is now a quality decision,” explained Jason.